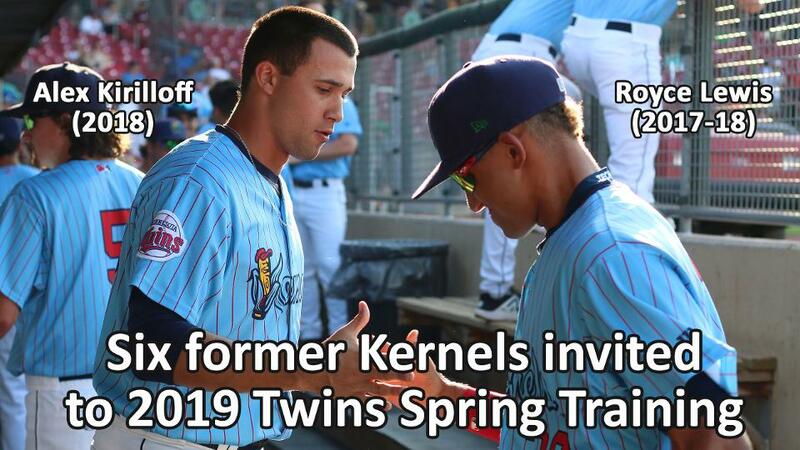 Cedar Rapids, IA - Six former Cedar Rapids Kernels players were among 20 non-roster players invited by the Minnesota Twins to 2019 Major League Spring Training in Fort Myers, FL. They are pitchers Ryan Eades (2014) and Jake Reed (2014); catchers Brian Navarreto (2014) and Ben Rortvedt (2017-18); infielder Royce Lewis (2017-18); and outfielder Alex Kirilloff (2018). Seventeen more former Kernels will be in camp as members of the Twins 40-man roster. A total of 60 players are scheduled to be in Spring Training (40 roster players plus 20 non-roster invitees). Twins pitchers and catchers are scheduled to report on Wednesday, February 13th, with their first workout slated for Wednesday, February 14th. The balance of the squad is scheduled to report on Sunday, February 17th with full-squad workouts beginning on Monday, February 18th. The Kernels open the 2019 Midwest League season at home on Thursday, April 4th against Peoria at 6:35 PM. Watch for the release of the Kernels 2019 Pocket Schedule at locations around eastern Iowa the week of March 11th. Season ticket packages for the 2019 season are on sale now by calling Peter Keleher at (319) 896-7622 or by email at peter@kernels.com. Individual game tickets for the 2019 season go on sale Monday, March 18th at 10 AM.